I picked this little guy up at an auction in the summer , along with three other smaller stools for $20.00 total . It was being used for standing on to reach things in the upper cupboards (yes I am on the short side)and sometimes for sitting on while putting on or taking off my shoes, but ever since I brought it home, I knew it was destined for something more…..
of $449.00 what’s a girl to do….Make a faux fur one, that’s what, and I did it for under $25.00. I was at my local Walmart picking up some craft supplies, I wondered into the linen section and saw an adorable faux fur pillow for $16.97 (I wanted it but thought to myself, I bet I could make that cheaper…). I kept looking and came upon a white faux fur rug for only $19.97. 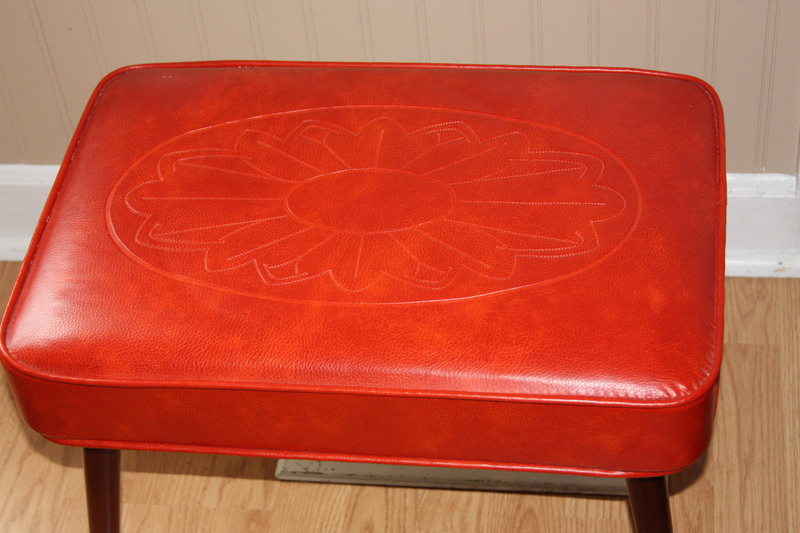 Not only would it cover my little orange “auction sale” stool, I’d have enough left over to make a pillow or maybe two – woo hoo!! It looks so soft and comfy…just draped over my chair 🙂 don’t ya think?? 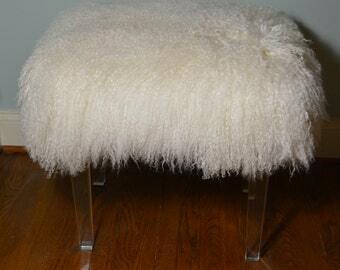 It was very simple to accomplish my very own faux fur stool. I unscrewed and removed the legs, placed the legless stool on the wrong side of the fabric, measured around to ensure there was enough material to cover the top, sides and just a little of the bottom. 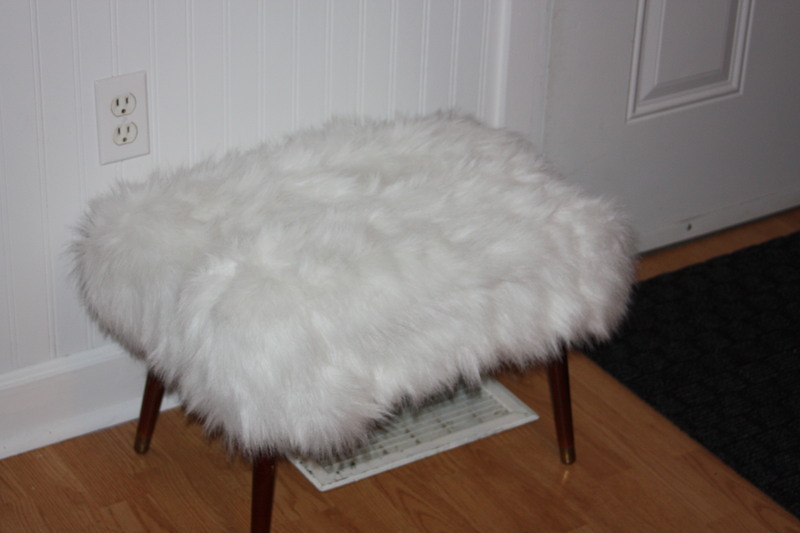 I cut off what I needed and then used my electric staple gun to secure the faux fur to the underside of the stool. I wasn’t too particular at the corners (like you usually have to be) because of the type of material and I wanted it to look full and fluffy anyway. I put the legs back on and turned it over, fluffed it up a bit and was very happy with the way it turned out. 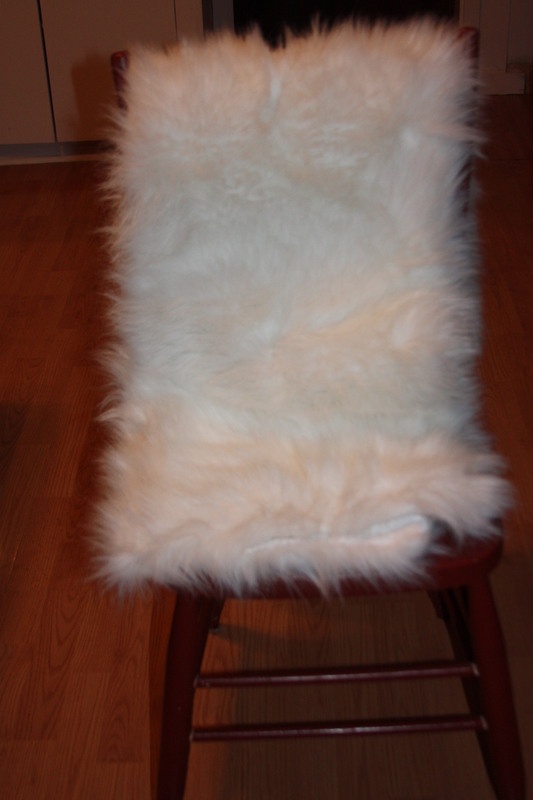 I think it looks great, I can’t wait to make my pillow…..ahhh another Wandaful thing!!!! 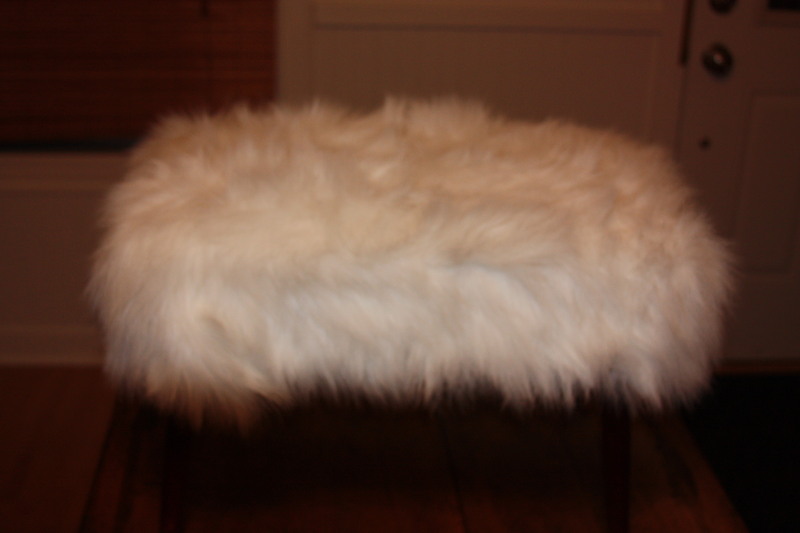 This entry was posted in Decorate, DIY and tagged auction, cozy, Decorate, DIY, easy, faux, fluffy, fur, inexpensive, pillow, reaching, rug, sale, standing, staple gun, stool, Walmart, white. Bookmark the permalink. I want one! Now I have to start looking for second hand stools. Sigh.